Winter in the tropics can be rather damp and the last few days have been especially so. Here in the "convergence zone" where the northerly winds turn into southerly ones, the skies tend to be cloudy and it rains! That the temperature is in the mid to high twenties is no consolation. 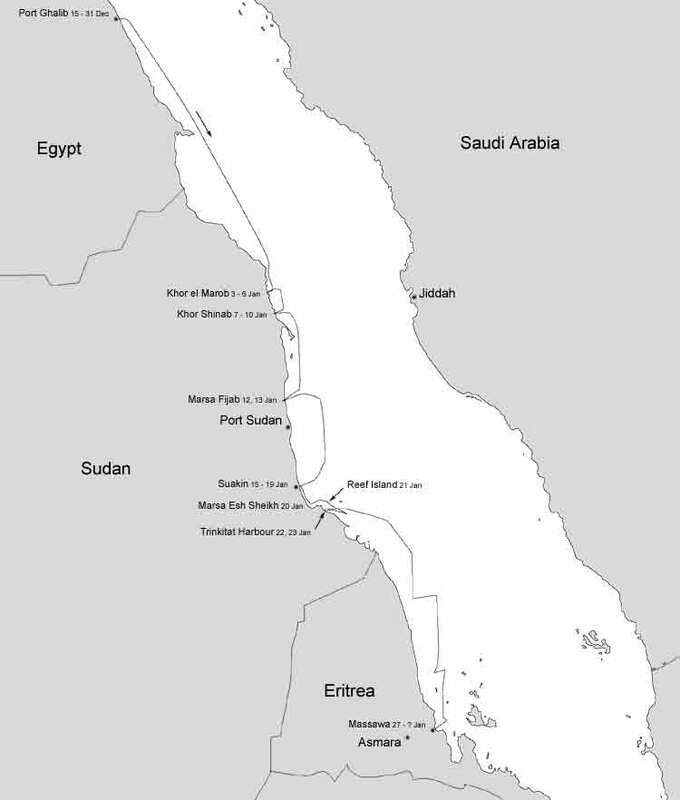 >From Marsa Esh Sheikh we kept inshore and navigated our way through the Shubuk Channel. It's a shortcut through the reefs and well marked by beacons so we enjoyed the experience. We were hoping to visit a good snorkelling anchorage on the way but the forecast calm didn't materialise so we had a good sail instead (once through the narrow channel) and kept going, spending the night at a sheltered spot imaginatively called Reef Island. The other rally yachts were anchored in nearby Trinkitat harbour and set off before us the next day for a long passage to Khor Narawat. We followed expecting to get to an anchorage about half-way there but by the early afternoon the wind turned to the south slowing everyone down. Some of the yachts turned back rather than arrive in the dark. Also one yacht, Idyllic, had engine problems. Our anticipated anchorage would have been difficult in southerly winds so we also turned round and headed to Trinkitat. We were first in so received the usual welcome from the local military, who said they were not surprised to see the yachts returning as they had expected the winds to be unfavourable. Paul spent the next day helping the skipper of Idyllic sort out his engine cooling system without much success, lacking the necessary spare parts. We all decided the sensible thing would be to sail straight on to Massawa from Trinkitat as soon as possible. Since we were outside VHF range of Khor Narawat where the other rally yachts were, we used the HF radio to communicate. When free sailing Denise on Alero calls everyone up on the HF at 8am and 7pm for a position check. Only 6 of the rally yachts have HF radio but we are usually scattered among the fleet and between us within VHF range of the other yachts to keep in touch. The only problem with HF radio is that it is power hungry and with so much cloud recently our batteries have been missing the input of the solar panels. We ended up spending 3 whole days getting to Massawa, passing the border and hoisting the Eritrean courtesy flag on the way. The first day and night (Thursday/Friday) of our passage were wonderful, sailing on a comfortable reach with moderate easterly winds. We had dolphins visit and seabirds around us most of the time and a full moon at night. Then on Friday morning the wind dropped completely and we struggled to make any progress all day. Most of the rally yachts used their engines but we had decided to sit it out and conserve our fuel stocks. By Saturday morning we realised we'd have to spend a third night at sea and spent the morning calm doing chores and making bread. Finally the wind picked up at mid-day and we made good progress into the evening. By midnight the moderate easterly wind had changed to a strong northerly. We sailed under a fully reefed main but were going too fast, threatening to arrive in Massawa before daylight so we hove to for four hours. We arrived in Massawa on Sunday morning with grey skies above us. It rained as we launched the dinghy to go ashore to check-in. The yacht anchorage is a long way from the port and we had a wet 20 minute trip, finding that the office had closed by the time we got there. There is no agent dealing with sailing yachts in Massawa so we spent most of Monday morning filling in forms, getting shore passes, local money and eventually visas. Massawa is quite a big port but not very busy so having to process 15 yachts and their crews on one morning was quite a task. The officials were all very courteous and all spoke very good English. Eritrea has 9 different languages, including Tigrinia with it's own special script and Arabic. Once we had our visas we were able to explore the town and sit outside in a street cafe to drink coffee or local beer. The town was badly bombed in the struggle for independence from Ethiopia and the country is extremely poor but the people are very friendly and welcoming. We're planning to visit the capital city, Asmara tomorrow and spent much of yesterday morning getting a travel permit as foreigners are not allowed to go anywhere without a specific permit. The skies have continued to be overcast until today so we've not got any good photos this time but an updated routemap instead.